Caterham’s legendary Seven family is boosted next month (February) with the arrival of the brand-new 150 bhp Ford Sigma to deliver a rasping 270bhp per tonne for just £17,495. The arrival of the 150bhp variant of the two-seater marks a departure from Caterham’s original plans when it first announced details of the replacement for the long-serving K-Series engines last autumn. The entry-level 125bhp version of Ford’s Sigma powerplant was so good when mated to the new, stiffer chassis, that engineers decided to raise the bar for the planned mid-range model by a further 25bhp – not the 15bhp initially slated. Prices for the 150 powerplant will start at £17,495 in Roadsport guise, or for those looking for a stripped down, more track-focused model, the Superlight will weigh in at an attractive £20,495. The latter, with its carbon-cycle wings, 6 speed box and uprated suspension, will offer a devilish 300 bhp per tonne and a 0-60mph time of around 4.6 seconds. In order to reach the new output, Caterham engineers revised the intake, added butterfly throttles and recalibrated the engine mapping on the Ford 1.6-litre unit. The result is a throaty, torque-filled unit delivering an extra 25 horses for just £1,500 more than the entry-level Roadsport model. The new mid-range Ford Sigma Seven benefits from the same perfect blend of meaty torque, stiff lightweight construction, and exceptionally smooth power delivery that has made the 125bhp a winner with customers and the media alike.More than 10,000 road, and 1,200 track, miles have been completed as part of the Sigma engine validation process making it the most rigorous R&D programme of its kind in Caterham’s long and illustrious history. 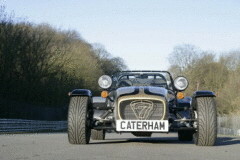 Caterham’s ambitious product strategy to replace the K-Series engine after 15 years service continues unchecked. More new models are in the pipeline including a blistering 50th anniversary one-off special planned for the 7’s Golden Jubilee celebrations at Donington, 2nd-3rd June 2007.